Flavia de Luce is twelve years old and has been “banished” from her home in England to the wilds of Toronto, Canada. In the world of this perspicacious, perceptive, precocious, preternatural preadolescent, science rules. Dead (preferably murdered) bodies and unmasking their killers are what she lives for. But she is still only twelve, so some things are beyond her ken — but crime is not one of them. 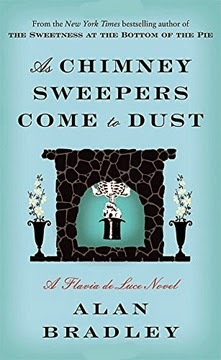 “As Chimney Sweepers Come to Dust” is the seventh in this disarming series set in 1950s rural England (and now Canada). The books could probably be labeled “young adult,” but certainly lots of grown-up customers of MBTB enjoyed them (including moi). The victims are mostly adults, but the bloodshed is mostly low key. Flavia is the youngest daughter of an impoverished aristocrat. Her mother died many years ago, and her two older sisters delight in saying nasty things to her, and she, in turn, treasures the pranks she pulls on them. Flavia feels disconnected from and misunderstood by her family, but when an opportunity to attend her mother’s old alma mater in Toronto arises, she still balks at leaving the only (dysfunctional) family she knows. A note here about Flavia's dysfunctional family: Although she and her sisters appear to be at perpetual war, in fact Flavia (as the narrator) often refers to nice memories of things her sisters have said or read to her. Alan Bradley manages to express the mind of an eccentric twelve-year-old very well. The books have been gradually turning into young adult, secret agent books from the original cozy English village mysteries. Whatever the future holds, Bradley entertains. John Twelve Hawks is a pseudonym. There have been many guesses, including Stephen King and James Patterson, about his identity. Whoever he may be, and more power to him if he wants to remain anonymous, he writes an eminently readable story. Although I enjoyed “The Traveler,” the first book Twelve Hawks wrote in his “Fourth Realm” trilogy, I never remembered to hunt down the other two books (“The Dark River” and “The Golden City”). 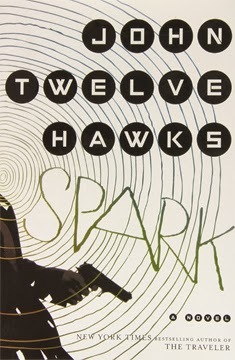 I stumbled upon Twelve Hawks’s “Spark” serendipitously and remembered I enjoyed reading him. He has great pacing and the ability to create memorable characters. Jacob Underwood (enforcer) is a much more fascinating character than his alter ego, Jacob Davis (computer programmer). That’s because Jacob Underwood is what was born after Jacob Davis had a permanently disabling motorcycle accident. His traumatized brain discarded vital elements of Jacob Davis’s personality. Davis was one of the guys, had a dim-witted model girlfriend, and played the game. Underwood has synesthesia and aspects of Asperger’s. He often “sees” colors when he smells or hears. He cannot differentiate emotional states in other people. He has no emotional states himself. He doesn’t enjoy food, music, or the company of people. He cannot bear to be touched. He has to follow “rules” to remember to eat and maintain a modicum of personal hygiene. All of which makes him not only a very interesting character to read about but a great hired assassin for an unscrupulous international banking concern. Underwood places everything at an equal level. A “human unit” is the same as a dustpan is the same as a tomato is the same as an umbrella. Killing a person has no relevance to his life except as a way of making money, something he is unable to do in any normal way. Only dogs, mysteriously, have an elevated status. Underwood is assigned targets in Paris. He must kill the son-in-law of an Indian magnate because the son-in-law has amassed information on his father-in-law’s wrongdoing. The father-in-law is a customer in good standing of the secret and nefarious departments of the international bank, Underwood’s employer. Out of spite, the magnate indicates his daughter and her child must be killed, too. If everything and everyone is on the same level of value, then killing a child should be no more difficult than throwing out a banana peel. In Underwood’s world view, a human unit’s “spark” would be extinguished. Big deal. This is where the story turns for Underwood, because he balks at killing the child. Is his brain slowly repairing itself, giving him more of a conscience, returning his morality? Is it an anomaly? What will this mean for carrying on with his livelihood? Running behind the scenes but at an equal level of interest is Twelve Hawks’s take on technology in the not-too-distant future. Triggered by a 9-11-type of disaster (“The Day of Rage”), most governments have authorized comprehensive intrusion into the private lives of their citizens. Cameras are everywhere, personal data is mined, government ID is required. There’s an underground movement to hold the government and its citizens accountable for replacing human workers with robots and inviting Big Brother into the world (think WikiLeaks, Assange, Snowden). Although other authors have used synesthesia and Asperger’s before, Underwood’s character’s quirkiness and charm combine with the disorders to make “Spark” a truly interesting read. 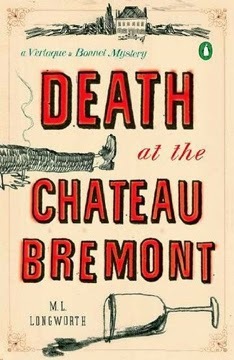 Our MBTB book group will be talking about “Death at the Château Bremont” at our May meeting. We almost always split in our opinions on the books we read, and welcome all sides to our lively discussion! The May 2015 meeting is scheduled for the fourth Tuesday of the month at the Belmont Branch of the Multnomah County Library. If you are in the Portland area, please drop by and join us! I have never been to Aix-en-Provence in France, but I would like to, especially after reading M. L. Longworth’s loving depiction of the area. Although Longworth was born in Canada and lived in the U.S. for some of her adult years, pretty early on she and her husband and daughter moved to an area close to Aix. She has been there for over fifteen years. She is perfectly situated to know what we unfortunate souls who do not live in Aix need to hear about this beautiful, delicious area. Longworth’s main protagonist is a “juge,” less a judge than a detective in this case. Antoine Verlaque has the ability and responsibility to investigate suspicious deaths, often working companionably with Commissioner Bruno Paulik of the police. Verlaque is an aesthete, so it’s a good thing he lives where he does. Can the wine be more delicious, the food tastier, the scenery more grand, and the clothing more à la mode than in Aix? Of course the flip side is he is sometimes pompous, snobbish, and dictatorial, without quite meaning to be. Perhaps the love of Verlaque’s life is Professor Martine Bonnet, a teacher of law at the local university. They have parted ways, but each longs for certain qualities in the other. When one of Bonnet’s childhood friends dies in a suspicious manner, Verlaque is happy to enfold her within the investigation. Longworth touches on the ins and outs of Aix society, French culture, and other aspects of la belle vie as a sensual background to a touching mystery. “Death at the Château Bremont” is the first of four Verlaque books so far by Longworth. 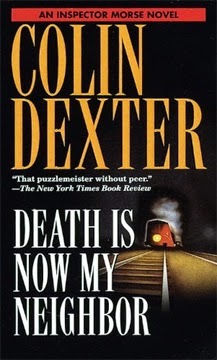 Yes, I read Colin Dexter’s Inspector Morse books out of order. Yes, I did not read “Death Is Now My Neighbor,” the penultimate Morse book, until just a few days ago, although I did cheat some years ago and looked at the last page for Morse’s first name. Now, of course, everyone who cares about Morse knows what his first name is since it is splashed across the title screen for the newest PBS Mystery series about Dexter’s iconic character. And if you care about Morse, you will have read this book anyway. For those of you who have never picked up a Morse book, or for those of you who have only a desultory experience with Morse-reading, this review is for you. Towards the end of the small series (thirteen novels over almost twenty-five years), Morse is a changed and changing man. In “Death is Now My Neighbor,” Morse’s vulnerability is laid bare. He is the best and laziest inspector (that’s “chief” inspector, please) in the Thames Valley force, situated in Oxford, England. Sergeant Lewis is the best and most compassionate assistant in said force. Morse delights in working the Azed crossword puzzles and crowing his superiority over Lewis’ practical and educationally scant knowledge. Oxford-educated Morse may know his culture, but Lewis knows his people. It is one of the most perfect “buddy” pairings in detective history, in my opinion. There are two stories at work in this book: the basic mystery and Morse’s personal story. For the sake of people who have not read other Morse books, I will forgo any description of Morse’s personal story. It will have more of an impact if you first read the other stories. It will make the revelations in this book more poignant. Morse and Lewis are assigned the murder of a young woman who has been shot in the head while standing in her kitchen early one morning. The shot came from outside, through her window and a partially-obscuring shade. As her past is investigated, it comes to light that one or more of her neighbors are potential suspects. It also is discovered that her lover is one of the two candidates for Master of Lonsdale College, a significant position. Her boyfriend, it turns out, is married and he would shudder at the thought that a peccadillo might unseat his chances of becoming Master. The list of suspects has now grown. After a second murder occurs, the story wends its way over to Lonsdale and the Master competition and a behind-the-scenes look at the delightfully devious and diabolical politics of academia. To solve the mystery, Morse is his usual dictatorial self and Lewis plods along in his efficient and effulgent way. I’m glad to have finally read this. P.S. If you have seen the televised version of this book, it does change the tenor of the book considerably. Morse's personal story has been eliminated, and for brevity's sake, some characters have been conflated.